Metabolic syndrome reduced by sun. Marc Sorenson, EdD. Metabolic syndrome is a group of physical conditions that are predictors of disease. And, it can also be an indicator that disease is already present. Hence, when someone suffers from metabolic syndrome, they will have many dangerous disorders. High blood pressure, obesity, high cholesterol, high triglycerides, Low HDL, glucose intolerance and insulin resistance. Furthermore, these disorders are linked to increased risk of cardiovascular disease and type 2 diabetes. And, they are often indicative of upcoming health disasters. How metabolic syndrome is influenced by sunlight. First of all, how does this tie into the benefits of sunlight? A recent study showed that a program designed to raise vitamin D levels reduced existing metabolic syndrome remarkably. Fifty-nine people with metabolic syndrome participated in the study. It is most noteworthy that these subjects were told to expose themselves regularly to sunlight and eat foods high in vitamin D. Metabolic syndrome, as a result, decreased by about half after one year on this regimen. Does other research associate metabolic syndrome with sun exposure? 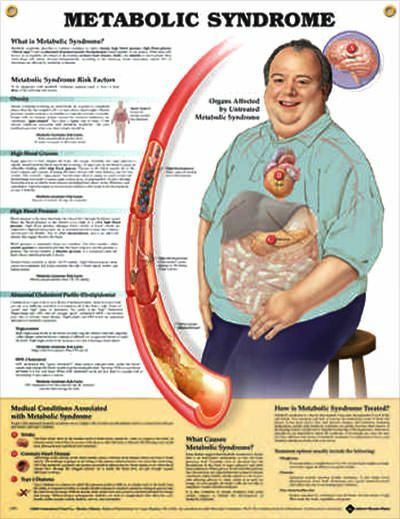 One major aspect of metabolic syndrome is obesity. Hence, research demonstrating a reduction of obesity also indicates a reduction of metabolic syndrome. So, let’s mention another scientific paper that “sheds more light” on the subject of obesity. This research was conducted on mice with shaved backs that were placed on a high-fat diet and then exposed to non-burning ultraviolet radiation (UVR). UVR is one of the types of light that is produced by sunlight. Especially relevant is that the mice should have gained weight rapidly. But the weight gain was impressively reduced when they were exposed to UVR. The treatment achieved a 30-40% reduction in weight gain, compared to the expected weight gain with the high-fat diet. Therefore, the “sun treatment” reduced the risk of obesity. And, it also reduced metabolic syndrome. Benefits of these treatments also included: significant reductions in glucose intolerance, insulin resistance and fasting insulin levels (all markers and predictors of diabetes and metabolic syndrome). In addition, nonalcoholic fatty liver disease and high cholesterol were also reduced. Furthermore, Dr. Gorman mentioned that the mechanism of weight loss may be dependent on nitric oxide (NO). NO originates from diet and is mobilized by UV radiation to become bioactive. This conclusion was due to another part of the experiment. Skin induction of nitric oxide (NO)—also a product of skin exposure to the sun—reproduced many of the positive effects of UVR. This was something vitamin D supplements could not do. It seems like there is no end to the miracles of regular, non-burning sun exposure. Consequently, do not disregard the sun and its health-giving effects. Just don’t burn. 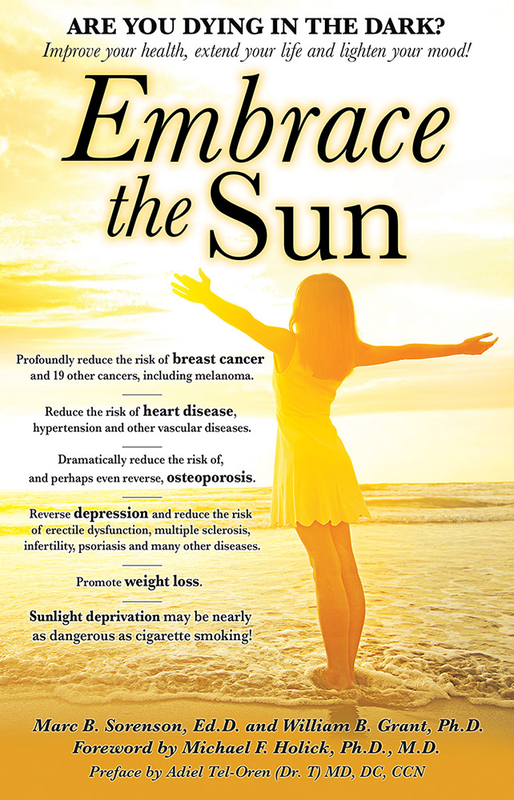 For more information, read my book, Embrace the Sun, available at Amazon. Nasser M. Al-Daghria, Khalid M. Alkharfya, Yousef Al-Salehb, Omar S. Al-Attas et al. Modest reversal of metabolic syndrome manifestations with vitamin D status correction: a 12-month prospective study. 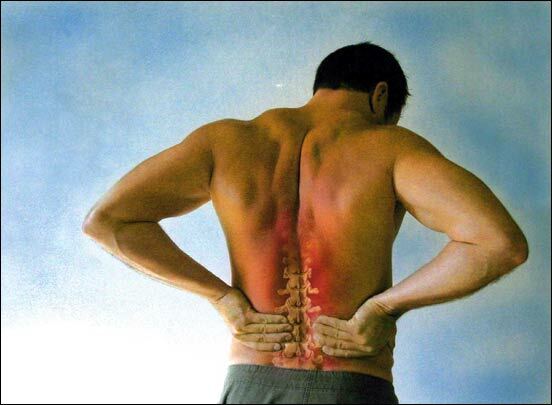 First of all, low-back pain is pandemic in much of the world. And, it is especially common in countries where most women wear clothing that prevents sun exposure to the skin. One of the first studies to show an association between LBP and reduced sun exposure was done in England: Northerners were 3-4 times as likely to suffer low-back pain as southerners. Of course, we know that there is less sunshine in the north. Other low-back pain research shows similar results based on latitudes. In addition, similar findings have been reported in Saudi Arabia and Pakistan. Researchers did a study on undergraduates in those areas. They researchers wanted to assess the students awareness regarding vitamin D deficiency associated with lack of sun exposure. These students often suffered from fatigue and muscular pain. Researchers concluded that many of them were acquainted with vitamin D deficiency, and some used a supplement. However, the investigators seemed to feel that supplements were not sufficient. 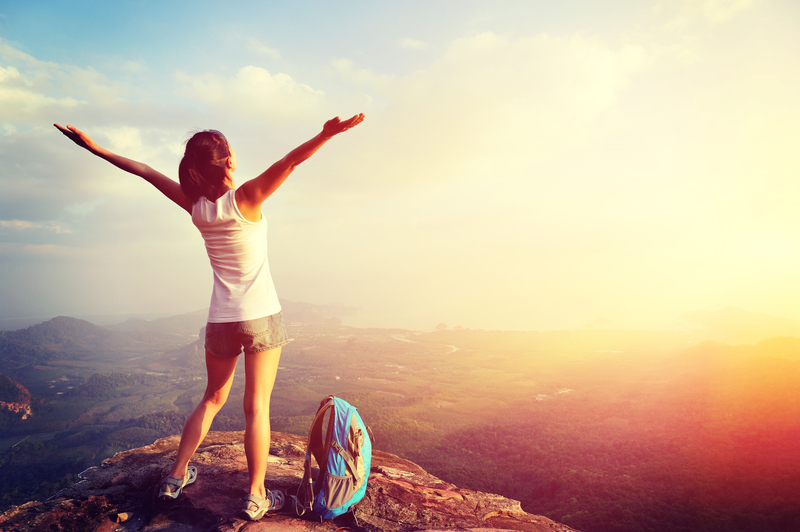 They believed that sun exposure was the best method to maximize vitamin D levels. In conclusion, they stated that the role of the sun, and the proper time and duration of exposure, could not be ignored. That is, if the students were to help effect a healthy and active society. Furthermore, they also indicated that since these students would be medical care givers in the future, their habits should be similar to the habits they intended to recommend to their future patients. My conclusion about sun exposure and low-back pain. Walsh K, Cruddas M, Coggon D. Low back pain in eight areas of Britain. J Epidemiol Community Health. 1992 Jun;46(3):227-30. Zeng QY, Chen R, Xiao ZY, Huang SB, Liu Y, Xu JC, Chen SL, Darmawan J, Couchman KG, Wigley RD, Muirden KD. Low prevalence of knee and back pain in southeast China; the Shantou COPCORD study. J Rheumatol. 2004 Dec;31(12):2439-43. Al Faraj S, Al Mutairi K. Vitamin D deficiency and chronic low back pain in Saudi Arabia. Spine (Phila Pa 1976). 2003 15;28(2):177-9. Qureshi AZ, Zia Z, Gitay MN, Khan MU, Khan MS. Attitude of future healthcare provider towards vitamin D significance in relation to sun exposure. Saudi Pharm J. 2015 Oct;23(5):523-527. Finally, you should understand this: sunscreen use associates closely with sunburning. That has been known since 2014. This is not a good product, therefore. We should protect ourselves from overexposure. But we should do it the way God (or Mother Nature, if you prefer) intended it: Cover up with clothing when you start to redden, seek shade, or go indoors for awhile. Good health depends on obtaining regular, non-burning sun exposure. Sales of sunscreens, first of all, are a multi-billion dollar industry. And, it seems like nearly everyone believes that they are a great protection against skin cancer. Especially relevant is the fact that as sales climb higher each year, melanoma risk increases in lock step. Furthermore, sunscreen sales in 1972 were about $18 million per year. And, the total USA market in 2005 had climbed to $640 million a year. Due to inflation, that is equivalent to $320 million in 1972 dollars, an almost 18-fold increase. 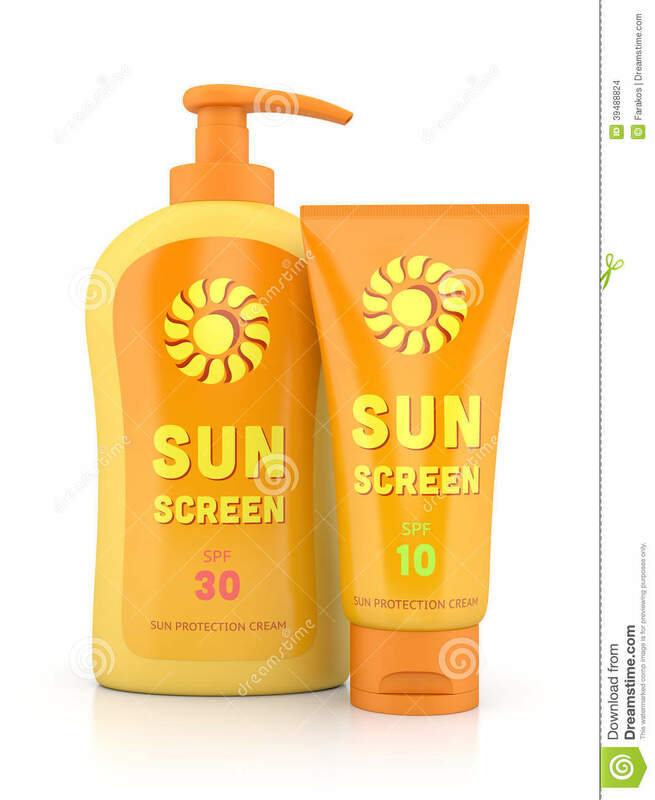 What about sunscreens in cosmetics? In addition, those figures pale by comparison with figures from 2013. The global sun care market generated $5.6 billion US dollars from its sun-protection products segment. Why? Because the sun care market includes sunscreens, many of which are ingredients in women’s cosmetics. Sales increased despite the fact that as early as 2003, it was known that sunscreens may have been partially responsible for increasing the deadliest of skin cancers, melanoma. Another important study demonstrates that sunscreens do not help prevent melanoma. The researchers’ goal was to determine the efficacy of sunscreens in preventing melanoma. Hence, they compared melanoma rates with sales in 24 countries in Europe, during the period of 1997-1999 to 2008 and 2012. They found that higher income people had significantly higher melanoma incidence. And, increased use of sunscreens had not prevented higher income populations from being at higher risk of melanoma. Consequently, we see this equation: Higher use=higher melanoma risk! One of the reasons for this little-known relationship is most noteworthy. Up to 99% of vitamin D production is stopped by sunscreen. Hence, many of the health benefits of sun are voided. In conclusion, the latest research must have deflated the egos of the sunscreen manufacturers: A meta-analysis of 20 studies showed what we would expect. Both melanoma and non-melanoma skin cancers were not protected by sunscreens. It is most noteworthy that sunscreens were associated with a slight increase in risk. We could probably say from the information I’ve presented that sunscreens are worthless at best, and dangerous at worst. So, who benefits? Those who benefit from sales are pleased, while the people suffer. Therefore, it seems like the manufacturers, and the industries they support, are probably quite pleased with the worthless product. Be careful about sunscreen ads! So, when you next view the propaganda, be careful before you drink the Kool-Aid. 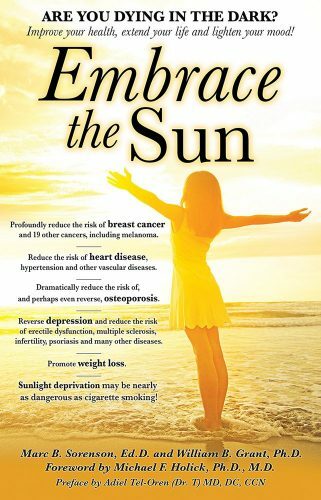 And, be sure to read my new book, Embrace the Sun. It contains a full section on the chicanery that is prevalent in the sunscreen conspiracy. You will be stunned when you learn the truth. Moss, R. Another Dissident Dermatologist.Cancerdecisions.com Newsletter. 2005. Haywood, R. et al. sunscreens inadequately protect against ultraviolet-A-induced free radical damage. Journal of Investigative Dermatology 2003;121:862-68. Elizabet saes da SILVA, Roberto TAVARES, Felipe da silva PAULITSCH, Linjie ZHANG4. Eur J Dermatol 2018; 28(2): 186-201. The best disinfectant is sunlight! Therefore, those who would frighten us away from the sun would do well to study its superlative disinfectant qualities, as I have. Why use a noxious chemical as a disinfectant, when the sunlight is waiting to be used? How do we know this? First of all, the German microbiologist Robert Koch, who isolated TB bacteria in 1882, showed that sunlight had disinfectant qualities; it destroyed the bacteria. In addition, even earlier, in 1877, other researchers discovered that sugar water left in the shade became cloudy, indicative of bacterial growth. But if exposed to sunlight, it remained clear. Hence, radiation is a potent bactericide, or disinfectant. 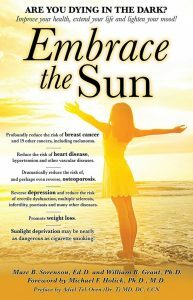 Dr. Kime, in his book, Sunlight Could Save Your Life, reviewed the results of research conducted between 1886 and 1909. Most noteworthy, it showed that the following bacteria were killed by ultraviolet light: Anthrax, plague, streptococci, tubercle bacillus, cholera, staphylococcus, colon bacillus and dysentery bacillus. It seems like sunlight was virtually forgotten with the advent of antibiotic drugs, but now the interest has returned. Do we need a natural disinfectant for superbugs? The interest in blood irradiation for infectious diseases is now kindling new interest, due to the resistance of the “superbugs” to conventional antibiotic therapy. Especially relevant as an example of this interest is found in a scientific book chapter from 2017. It is entitled, Ultraviolet Irradiation of Blood: “The Cure That Time Forgot?” The paper reviews the history of blood irradiation in the cure for infectious diseases. The author makes the following observation: “No resistance of microorganisms to UV irradiation has been reported, and multi-antibiotic resistant strains are as susceptible as their wild-type counterparts.” Consequently, the answer to the superbug dilemma is known, but will it be used? Perhaps not. It could cost the pharmaceutical industry a fortune if a better disinfectant were found. In addition, Dr. Kime also cited research showing that UV therapy killed flu virus outside the body and destroyed cancer-producing viruses. He reported good results in his own practice in treating fungal infections with sunlight as a disinfectant. Other early research showed that all bacteria within eight feet of low-intensity UV lights were killed in ten minutes. A Mexican friend invited me to tour a bottled-water plant in a town called Juchipila. 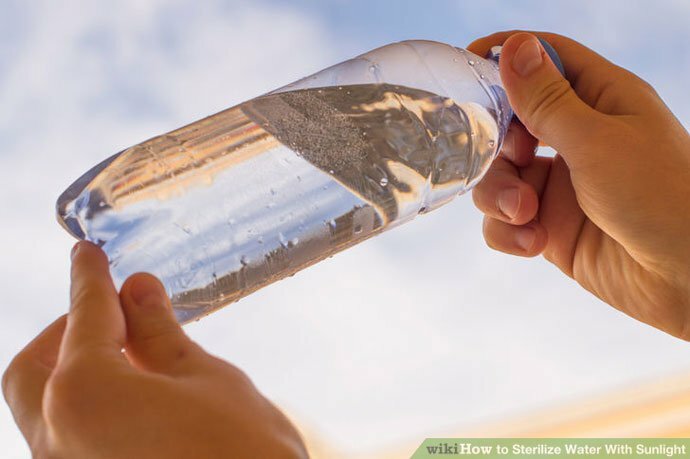 Interestingly, the water was exposed to UV as a disinfectant method, an inexpensive technique used in many countries. Sunlight also kills E. coli bacteria in twelve feet of seawater and in waste stabilization ponds. The Sonicare electric-toothbrush company now sells a sanitizer based on UV. The brush, after use, is placed in the UV sanitizer, because the UV light kills millions of germs in 10 minutes. This piece of history is also especially relevant: Nursing pioneer Florence Nightingale insisted that hospitals for wounded troops be constructed to allow free entry of sunlight. So, how many hospitals today follow her brilliant advice? Due to short memories, hospital construction returned to the “dark ages” after the advent of antibiotic drugs. Consequently, in the USA, nosocomial infections (acquired in a hospital) occur two million times yearly and claim 90,000 lives. Meanwhile, the solution to most nosocomial infections is right outside the building, and no one will let it in! That solution is the disinfectant potential of unobstructed sunlight. At the very least, hospital rooms should be cleansed daily with UV of sufficient strength to kill surrounding bacteria. Probably, hospital profits would improve since they are businesses, after all. Cost savings with the natural disinfectant: sunlight. The University of Pennsylvania’s Center for Health Transformation states: “Nosocomial infections create terrific problems by prolonging hospital stays, occupying scarce bed-days, requiring a greater number of diagnoses, more medication, and a greater burden on doctors and nurses.” They estimate, “If a 300-bed hospital with 10,000 admissions yearly had a 5 percent annual infection rate (500 infections) with costs of $600 to $50,000 depending on the type of infection, the total costs for these infections could be as high as $7.6 million.” So, multiply that by the number of hospitals. Imagine the savings if they let the light in! The patients in such rooms would also be happier and have a more positive outlook. It makes sense to return to a sanitation method used successfully for millennia, especially given the reality of superbugs. The antibiotic drug revolution destroyed the successful and promising use of UV lamps and sun exposure as antiseptic, disinfectant, pro-immunity treatments. Antibiotics are failing. Therefore, the interest in UV must be renewed. We walk in darkness (or under artificial light) due to our obsession with the pursuit of new antibiotics, Hence, we fail to see the brilliant source of healing that awaits us outside. Serendipitously, I happened on an article called Natural Alternatives to Bleach for Disinfecting. It discussed pros and cons of such disinfectants as bleach, vinegar, hydrogen peroxide and yes, sunlight. In conclusion, the article stated that bleach could be dangerous. It could cause irritation to the eyes, mouth, lungs and skin, and could result in the release of toxic fumes. Therefore, this is not a good disinfectant! In addition, the authors also mentioned that exposing the armpits to the sun would kill odor-causing bacteria. There is little I (Sorenson) enjoy more than sunbathing with my hands behind my head and my armpits exposed to the sun. Lots of vitamin D, nitric oxide and endorphins produced, and therefore, I am more popular with my friends—without using deodorants! Sunlight is a disinfectant for smelly socks! Furthermore, research has shown that sunlight may be a good disinfectant for your socks and feet. Scientists tested socks contaminated with the fungus causing tinea pedis (“athlete’s foot”), a chronic skin disease. The objective of the research was “to evaluate the effectivity of sun exposure in reducing fungal contamination in used clothing.” Fifty-two socks, proven by fungal culture to be contaminated by patients with tinea pedis, were studied. The the researchers divided the samples into two groups: Group A underwent sun exposure for 3 consecutive days and Group B remained indoors. At the end of each day fungal cultures of the samples were performed. As a result, the researchers reported that elimination of the fungal cultures was significant in the sun-exposure group, but not the indoor group. Sunlight is a great disinfectant, indeed! Finally, I remember my childhood. I won’t forget how fresh the clothing (including the socks) smelled after my mother had laundered and hung it outside in full sunshine to dry. I expect that fungi or bacteria were eliminated, along with odor, which would have occurred in a dark place. Downes, A. Researches on the effect of light upon bacteria and other organisms. Proc Roy Soc Med 1877;26:488. Cited in Kime, Z. Sunlight Could Save Your Life. World Health Publications, Penryn, CA 1980:126-30. Miley, G. The Knott technic of ultraviolet blood irradiation in acute pyogenic infections. New York J Med 1942;42:38. Rebbeck, E. Ultraviolet irradiation of autotransfused blood in the treatment of postabortal sepsis. Amer J Surg 1942;55:476. Rebbeck, E. Ultraviolet irradiation of the blood in the treatment of escherichia coli septicemia. Arch Phys Ther 1943;24:158. Hancock, V. Irradiated blood transfusions in the treatment of infections. Northwest Med 1934;33:200. Miley, G. The present status of ultraviolet blood irradiation. Arch Phys Ther 1944;25:357. Hamblin, M. Ultraviolet Irradiation of Blood: “The Cure That Time Forgot”? Springer International Publishing AG 2017. Ahmad (ed. ), Ultraviolet Light in Human Health, Diseases and Environment, Advances in Experimental Medicine and Biology 996, https://doi.org/10.1007/978-3-319-56017-5_25. Hollaender, A. The inactivating effect of monochromatic ultraviolet radiation on influenza virus. J Bact 1944;48:447. Heding LD, Schaller JP, Blakeslee JR, Olsen RG. Inactivation of tumor cell-associated feline oncornavirus for preparation of an infectious virus-free tumor cell immunogen. Cancer Res 1976;36:1647. Hart, D. Sterilization of the air in the operating room by special antibacterial radiant energy. J Thorac Cardiovasc Surg 1936;6:45. Gameson, A. Field studies on effect of daylight on mortality of coliform bacteria. Water Res 1967;1:279. Wang TT, Nestel FP, Bourdeau V, Nagai Y, Wang Q, Liao J, Tavera-Mendoza L, Lin R, Hanrahan JW, Mader S, White JH. Cutting edge: 1,25-dihydroxyvitamin D3 is a direct inducer of antimicrobial peptide gene expression. J Immunol 2004;173:2909-12. University of Pennsylvania Center for Health Transformation 2006. Amichai B, Grunwald M, Davidovici B, Shemer A. Sun as a disinfectant. Isr Med Assoc J. 2014 Jul;16(7):431-3. First of all, seventy-five percent of these cancers occur on areas of the body that are seldom or never exposed to sunlight. For example, research has shown that melanomas in women occur primarily on the upper legs, and in men more frequently on the back—areas of little sun exposure. The same as in the US, while sun exposure in Europe has profoundly decreased, there has been a spectacular increase in the disease. Men who work outdoors have about half the risk as men who work indoors. Hence, sun exposure could not me the cause. in addition, outdoor workers, while receiving 3-9 times the sun exposure as indoor workers, have had no increase in melanoma since before 1940, whereas the incidence in indoor workers has increased steadily and exponentially. Especially relevant is that sunscreen invention, along with its steadily increasing use, has not reduced the risk of melanoma. Rather, the disease has increased as sunscreen use has increased. 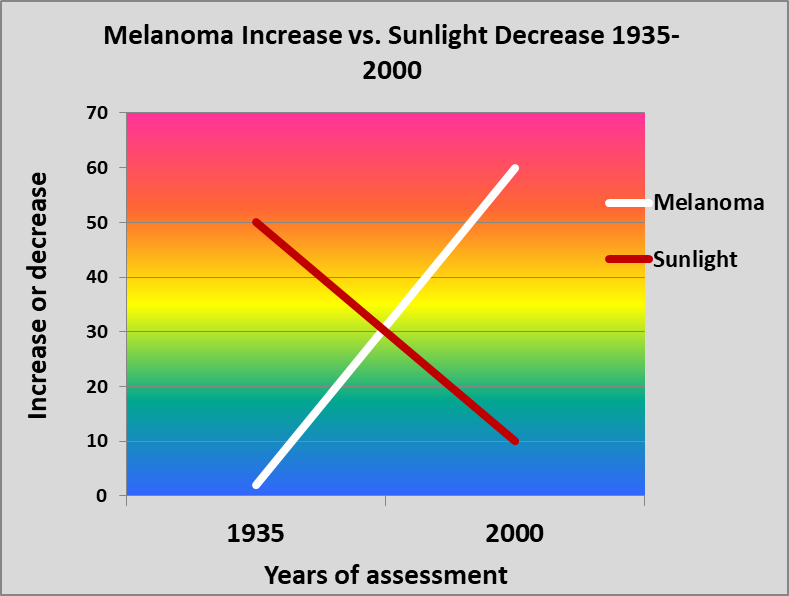 Increasing melanoma incidence significantly correlates with decreasing personal annual sunlight exposure. Also, outdoor workers get many sunburns but still have dramatically lower risk of contracting the disease. 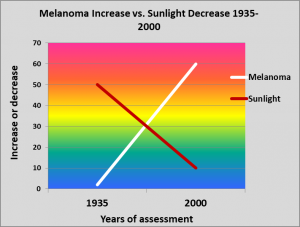 So, since melanoma increases as sun exposure decreases, should we continue to blame the sun? First of all, people in the highest quintile (fifth) of alcohol consumption have a 65% increase in risk. Weekly meat consumption increases the risk of melanoma by 84% and daily fruit consumption reduces the risk by nearly 50%. Furthermore, those with the highest levels of blood PCBs have 7-times the risk compared to those with the lowest levels. Recent use of Viagra is associated with an 84% increase in risk, and long-term use of the drug is associated with a 92% risk increase. Finally, there is a positive association between melanoma and obesity. Furthermore, Dr. Adele Green found that the strongest risk factor for both limb and trunk melanoma was moles. The presence of more than 10 moles on the arm predicted a 42-times increased risk. Therefore, please stop blaming the sun. Safely embrace the non-burning sun and reduce your risk of melanoma. Crombie IK. Distribution of malignant melanoma on the body surface.Br J Cancer. 1981 Jun;43(6):842-9. Ian D. Wyatt and Daniel E. Hecker. Occupational changes in the 20th century. Monthly Labor Review, 2006 pp 35-57: Office of Occupational Statistics and Employment Projections, Bureau of Labor Statistics. US Congress, Office of Technology Assessment, Catching Our Breath: Next Steps for Reducing Urban Ozone, OTA-O-412 (Washington, DC: US Government Printing Office, July 1989). Millen AE, Tucker MA, Hartge P, Halpern A, Elder DE, Guerry D 4th, Holly EA, Sagebiel RW, Potischman N. Diet and melanoma in a case-control study. Cancer Epidemiol Biomarkers Prev. 2004 Jun;13(6):1042-51. Gould Rothberg BE, Bulloch KJ, Fine JA, Barnhill RL, Berwick M. Red meat and fruit intake is prognostic among patients with localized cutaneous melanomas more than 1 mm thick. Cancer Epidemiol. 2014 Oct;38(5):599-607. Gallagher RP, Macarthur AC, Lee TK, Weber JP, Leblanc A, Mark Elwood J, Borugian M, Abanto Z, Spinelli JJ. Plasma levels of polychlorinated biphenyls and risk of cutaneous malignant melanoma: a preliminary study. Int J Cancer. 2011 15;128(8):1872-80. Karimi K, Lindgren TH, Koch CA, Brodell RT. 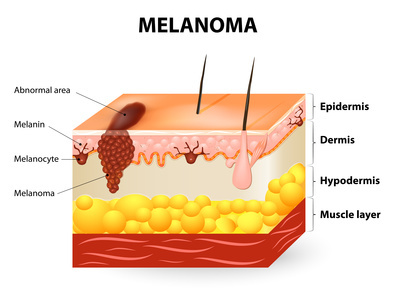 Obesity as a risk factor for malignant melanoma and non-melanoma skin cancer. Rev Endocr Metab Disord. 2016 Sep;17(3):389-403. Green AC, Siskind V. Risk factors for limb melanomas compared with trunk melanomas in Queensland. Melanoma Res. 2012 ;22(1):86-91.